A shape is concave if part of it is pushed inwards, or "caved in". It is the opposite of convex , where all parts of the figure point outwards. In a geometric figure, it is concave if you can draw at least one line segment between two points on it that is outside the figure. 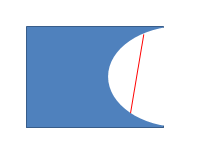 For example, in the figure below, the shape is concave because you can draw a line segment, such as the one shown in red, that links two points on the figure but which remains outside the figure.